What happened was this: I had a sudden, out-of-nowhere craving for oatmeal chocolate chip cookies. Not just any oatmeal chocolate chip cookies—the ones I used to make when I was a kid: thick and chewy, loaded with chocolate, but not too sugary, and not too big. Pure comfort food. Which would have been fine, but it was just coming up on Hallowe’en, and I didn’t want to be stuck with the 9 dozen cookies that the recipe makes on top of all the leftover candy that I could see in the future. Now, if I’d been smart, I’d have just cut the recipe in half, or maybe quartered it. That would’ve been the easy, straightforward thing to do. But, no. I only wanted one or two cookies. I only wanted to make one or two cookies. I tried adapting my go-to single-serve cookie recipe. It… didn’t work. Tasted good, but they weren’t the cookies I wanted. And here we are. I didn’t manage to get it down to just one or two cookies, I did manage to cut my original recipe down from 110 cookies to four. Share ‘em with a friend. Or keep them for yourself. I won’t tell. The ultimate comfort food: the perfect snack on an autumn afternoon. In a small bowl, cream together butter and sugars. Stir in egg yolk, vanilla, and salt. Add flour, rolled oats, and baking soda, and mix well. Stir in chocolate chips (and raisins, if using). Drop by heaping spoonfuls onto the prepared baking sheet. Bake for 10-12 minutes, until lightly golden and just set in the middle. Cool on the baking sheet for 3 minutes before transferring to a cooling rack. 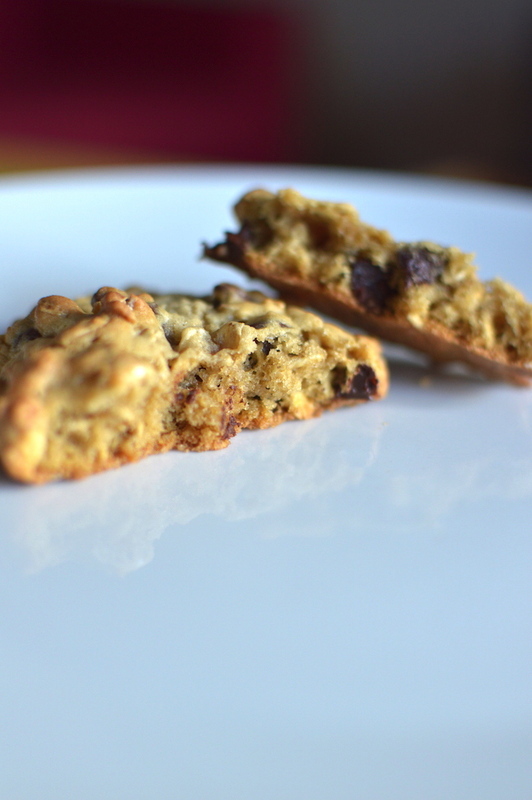 Variation: If you don’t like chocolate chips (really? ), don’t have any on hand, or just feel like changing up the recipe, you can substitute nearly anything you like: more raisins, nuts, dried cranberries or other fruit. Just make sure to keep the total to no more than 4 Tbsp of your preferred filler.